I’ve loved Salisbury Steaks since I was a kid. I never knew I could make them so easily in my Instant Pot! 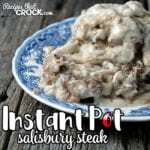 So, of course, I had to share with you this Instant Pot Salisbury Steak recipe! Turn your 6-quart Instant Pot on and to the Saute setting. While it is heating up, mix together your beef, eggs and onion soup mix. Make 12 small, thin patties out of your beef mixture. Once your Instant Pot says, “HOT”, put in your butter and wait for it to melt. Once your butter is melted, add in 3-4 patties and let them brown for 4-5 minutes on each side. Remove browned patties and put them on a plate while you brown the rest. When all of your steaks are on your plate, turn off the saute feature and plop in one can of cream of mushroom soup and spread it out evenly. Top your soup with a layer of Salisbury steaks and repeat layers, spreading your soup on top of your steaks, ending with the rest of your soup. Put your lid on and seal it. Turn on meat setting for 25 minutes. Let it stand for 15 minutes after it goes off (do not let the warm feature kick on) and then quick release, if needed. Serve steaks with gravy over them. I had some of my steaks all apart while I was browning them, it was fine with me because I knew they would still be delicious. However, I wanted to share with you that if you make larger patties, they are more likely to fall apart. So you will want to make small, thin patties so they will stay together and cook all the way through.